So it’s been a hot minute since I have posted anything recently. Life has just been busy and sometimes life commitments get in the way of my hobby of blogging & vlogging. I really do promise to be more consistent in providing updated content. I have so many things I want to share with you all and not enough time to do it all in! With that being said, since I waited so long to film my empties vlog I broke it up in to three different videos so it wouldn’t be so long that no one would want to watch. If you aren’t familiar with what an Empties vlog is, it is basically where you go through your trash and give a quick review of the products you have used up. Providing your thoughts on the product, if you would buy it again or if you would recommend it etc. Empties blogs/vlogs are one of my favorite topics to read and watch because it really shows you what your favorite vloggers/bloggers are actually using. If someone has actually used up an entire product then it seems like their opinion on the product is probably more honest and real (that’s just how I look at it anyway). So…if you are interested, the links for Part 1, 2 and 3 are below. I hope you will check them out and if you aren’t already following me on YouTube don’t forget to like, comment and subscribe! Last and most importantly, If you have a YouTube channel I’d love to follow you as well so leave me a comment below & link to your most recent video so I can check it out. Welcome back to my blog, or if you are new here, welcome! I hope you like what you read and will subscribe! If you don’t know already, I had WLS (weight loss surgery, for those new to the lingo) 11/7/16. Although there are four types of surgery options, I had RNY aka standard gastric bypass. For the last two months I have been trying to get used to my new normal. I have also been hesitant to post or vlog much about it. I think for me the hesitancy was due to me being in denial that this surgery was going to work for me. I kept thinking “ok great, I’ve had surgery but will I really loose any weight?” That is completely ridiculous to think that way but apparently it’s totally normal. So as it turns out, I will (and have) lost weight and I figured it could be helpful for others considering the option of WLS if I honestly chronicled my journey through my vlog and blog. I may not always be consistent but I will randomly be posting my progress, set backs, NSVs (non scale victories) and more. Don’t worry, my blog (and vlog if you follow me on YouTube) will still continue to be beauty/makeup and foster parenting related too and not all about weightloss and post-op life to keep things interesting. That’s the beauty of following me, you never know what you might get as my topics are all over the place, but that’s me and this is my life. My hope is that someone out there finds me relatively entertaining and laughs at my sarcasm and decides to follow me on this journey we call life. That they can relate, get a laugh or two and be motivated to take charge of their life and health to be the best they can be as well is my ultimate goal. So as I stated my surgery date was 11/7/16, and I am two months out or 8 weeks basically. Now that I’m adjusting to this new way of life, so many things in my life are different and those things are happening really quickly. 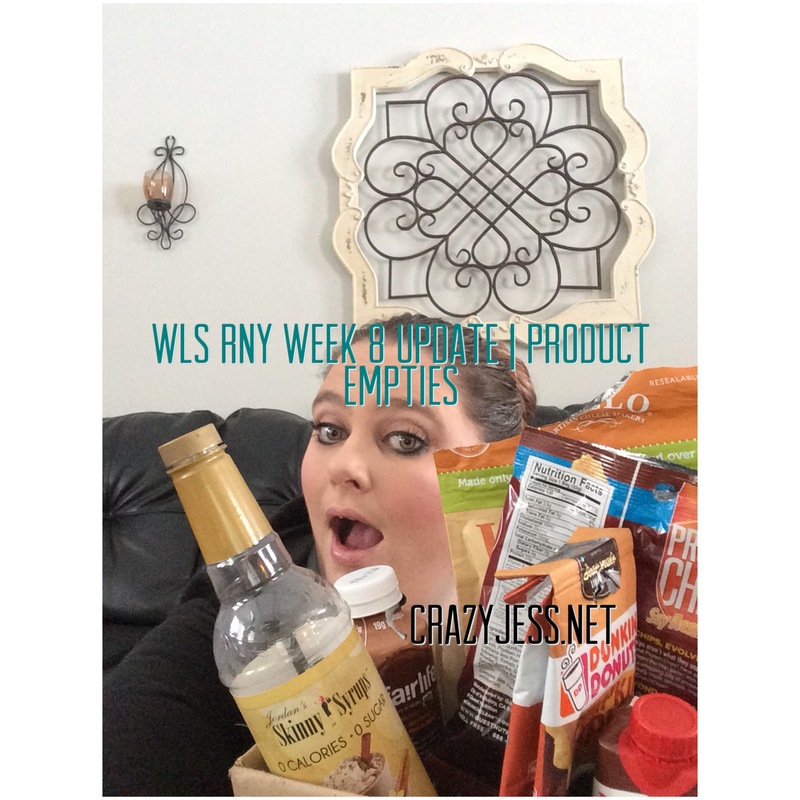 I posted a vlog about it, as well as went over my WLS food product empties for the month of December. Check it out below. I’m very proud of the lbs lost but I struggle and work hard at this every day. Struggling with battling old behaviors, not always staying on plan and not always counting calories and measuring out my food just to name a few. I will always be honest about what I’m doing well and what I’m not doing so well at along the way to be as open and honest with you all as I can be. It’s so important to understand that WLS is not a magic wand that will take all your weight problems away. It is simply a tool to help you reach your weightloss goals that requires a lot of hard work, dedication, and self control. So that’s my progress update for now. Don’t forget to comment, like and subscribe for all my future updates and randonmness!